The solution to all your homemade candy problems has arrived. Homemade candy always sounds magical in theory, but when it actually comes down to it, the experience can often end up being less than satisfactory. Unless you’re a bona fide genius in the kitchen, you know what we’re talking about. We’ve all experienced our fair share of caramels that send us to the dentist’s office, peanut brittle that could double as cement, and fudge that crumbles in our mouths like a poorly made sand castle. There is nothing worse than a failure where you can literally taste the disappointment, especially when this failure brings long nights in the kitchen spent vigorously scrubbing burnt sugar from your pots and cursing Mary See and Willy Wonka for their confectionary brilliance. Let’s just face it, folks: homemade candy making is not a venture for the faint of heart. And when you add the strife of candy making to the hassle of gift wrap, you’ve really got yourself a conundrum. Who wants to present their sugary labors of love on flimsy paper plates, covered in wrinkly plastic wrap? It just seems a little anticlimactic, don’t you think? So what is a benevolent and goodhearted papercrafter to do? Should we consent to shell out the big bucks for the fancy truffles and strawberry bonbons that sit behind glass countertops like pieces of expensive jewelry? Should we spend hours slaving over the perfect treat bag? These are big questions, so let us give you an answer to solve your dilemma for at least one day more (cue Les Misérables song). May we introduce you to the simple, the illustrious, the adorable, the impossible-to-destroy, and the one and only: homemade pretzel turtles wrapped and packaged in our multi-purpose Cut Above™ Treat Bags! Use the simple recipe below with our Cut Above™ kits to make your goodies from your heart without breaking your heart in the process. 1. Preheat oven to 325 degrees. 2. Line baking sheet with parchment paper or baking mat. Arrange pretzels on pan. Top each pretzel with one chocolate or caramel candy. Place pan in oven for four to five minutes. Once candies are slightly softened, remove pan from oven. 3. Gently press nut or other candy into the center of each chocolate or caramel until it spreads across the pretzel. Set aside to cool. Refrigerate for quicker cooling. 4. 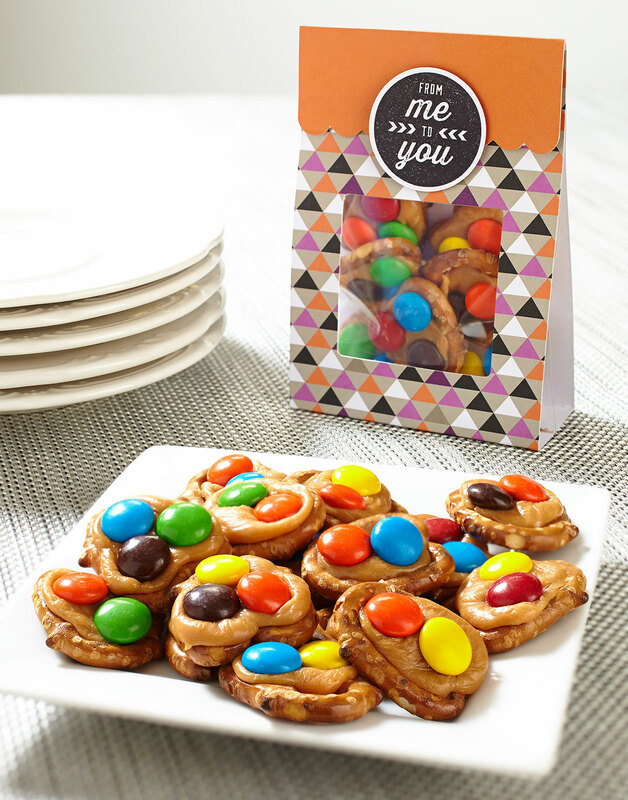 Wrap pretzel turtles in candy wrappers and place them in treat bags or pair with handmade cards for a gift that is personal and tasty. Or just gobble them up yourself. Your call. There you have it! Your homemade candy solution. They not only provide an excellent and easy option for homemade gifts, but they’re also a solid party treat that will disappear as quickly as you can make them. We hope you like these salty-sweet, bite-sized treasures as much as we did. Let’s just say that about five seconds after we finished the photo shoot, these little fellas were goners. P.S. Scratching your head and wondering what on earth a Cut Above™ kit could be? Watch this video to find out.